Following repaint into Go North East's corporate livery, this vehicle has transferred from Hexham Depot to Chester-le-Street. 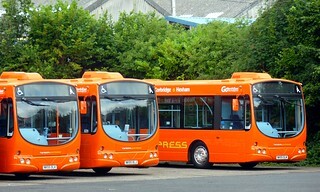 At Chester-le-Street; this vehicle will be primarily allocated to services 13/14, X22 and X25, allowing the cascade of older examples of the same vehicle type to another depot. 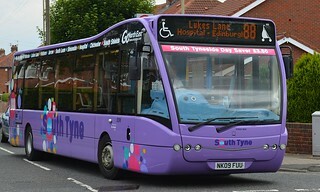 This vehicle has been repainted into Go North East's new corporate livery, having previously carried "Tynedalexpress" branding. This example carries the tagline "It's our fantastic people - all 2000 of them - that make the wheels on our buses go round and round". It has been released for cascade from Hexham Depot, where it was previously allocated to, following the entry into service of the refurbished Mercedes Citaro 0530N/Mercedes Citaro vehicles on "Tynedalexpress" services X84/X85. Having been out of service whilst undergoing repaint and refurbishment, this vehicle has now returned to service at Hexham Depot, seeing primary allocation to "Tynedalexpress" services X84/X85. To attract passengers from Arriva North East's 685 service; this vehicle has been fitted with free customer Wi-Fi, offering a more premium service specification for customers on Go North East's new "Tynedalexpress" X84/X85 services between Newcastle and Hexham. Prior to the launch of the new "Tynedalexpress" X84/X85 services next month, this vehicle has gained "Tynedalexpress" branding with sub-branding for services X84/X85. "Tynedalexpress" services X84 and X85 link the Tyne Valley and Newcastle with faster routes and great value fares. Each service operates hourly, yielding two buses per hour between Newcastle, Denton Burn, Corbridge and Hexham. 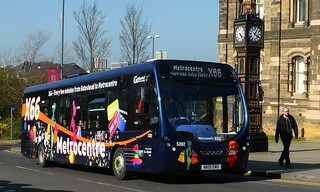 The X85 service is designed to compete with Arriva North East's long-established 685 service, which operates hourly between Newcastle and Carlisle, via Hexham. This vehicle has been temporarily removed from service at Chester-le-Street Depot. It has been sent to Thornton Brothers, Ashington, for internal refurbishment, prior to cascade elsewhere within the fleet. 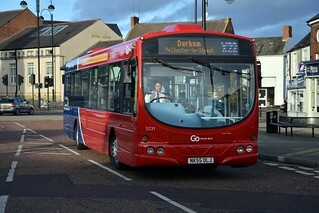 After 11 months of the experimental OK1 service operating; Go North East extended the service from Darlington to Middlesbrough, providing a direct bus link from the Wear Valley area, and to attract new users. The service was revised to terminate at Bishop Auckland northbound, as this corridor faced the biggest competition with Arriva North East, and just four journeys per day started/terminated at Crook. 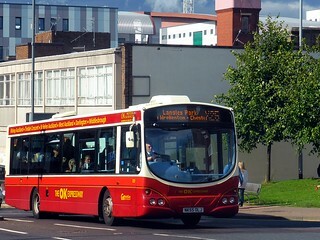 Whilst passenger numbers grew initially, numbers remained low except for a few busy journeys and as such, Go North East decided that the service was not sustainable to operate in the longer term. As such, the company withdrew the service after an 18-month period of operation, after the final journey on Saturday 10th August 2013. As such, this vehicle has transferred from Crook Depot to Chester-le-Street, in a reserve capacity, until due for repaint. This vehicle has gained "The OK Expressway" branding, with sub-branding for service OK1. Following the unexpected death of Wade Emmerson Snr. 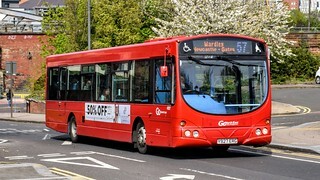 in August 1994, Go-Ahead purchased the company's operations from the majority shareholder of OK, Wade Emmerson Jnr., for £5.4 million in April 1995. This vehicle has transferred from Deptford Depot to the Crook outstation. 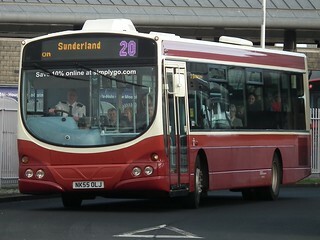 Ahead of the launch of a new experimental bus service, numbered OK1, this vehicle has been repainted into a plain maroon and cream base livery. Go North East plans to make a return to the town of Bishop Auckland, after almost six years of the company selling its operations to Arriva North East. 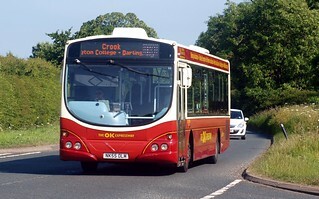 The new OK1 service aims to provide a new bus link from St Helen Auckland and West Auckland to Darlington, and a faster service from Crook and Bishop Auckland, in competiton with Arriva North East. 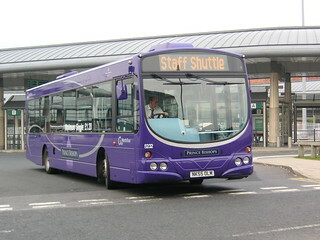 This vehicle has had its "Swift" branding removed, and now carries generic "Prince Bishops" branding, for service 20. 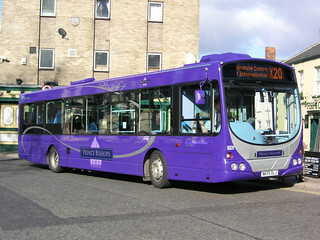 This vehicle has been repainted into a purple base livery with silver detailing, and has also received "Prince Bishops Swift" branding, for service X20. The branding is very similar to the branding carried by the main vehicles allocated to "Prince Bishops" service 20, with minor differences to differentiate the two different services. Prior to entry into service, this vehicle has received sub-branding for services X20/X50. 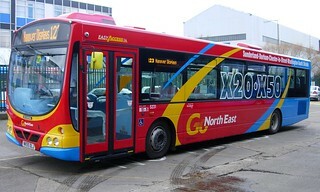 This vehicle, which carries Go North East's corporate livery, has arrived into the Go North East fleet, and is currently being prepared for service. It features high-backed Esteban Civic V3 seating. Replaced in the fleet at Chester-le-Street by Scania L94UB/Wright Solar 4945 (NK51 OLJ); this vehicle has transferred to Riverside Depot, acting as a replacement vehicle in the fleet at Riverside for Volvo B10BLE/Wright Renown 4900 (V990 ETN), which was withdrawn in February. 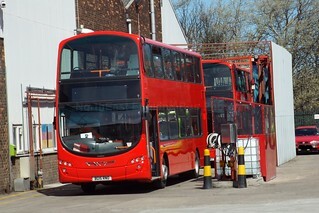 Ahead of its entry into service, this vehicle has been repainted into a plain red base livery.